Conn Carroll writes at Town Hall that Republicans are not likely to coalesce around a Replace plan in 2014, because any plan they put forth will be mischaracterized and demonized by the left and media. Congressional Republicans are not popular, he says, and President Obama would just veto any Republican plan anyway. Therefor any replacement plan will come out of the Republican primary race in 2016. According to that logic, we should never propose solutions because the left are bullies. Republican plans will be demonized by Democrats even if they don't exist, because that is their way. With health care especially, Democrats will be itching to repay Republicans for five years worth of opposition, and nothing plays into the liberal psyche like repaying the symbol of authority for a perceived grievance. Congress is not popular, but Congress is never popular. Without going too deeply into polling crosstabs or the Fallacy of Composition, just remember that the same people keep getting reelected. It would be called a monumental wave election if as few as 80% of incumbents were reelected to Congress. Congress is not popular as a group in part for the legitimate, designed-in, institutional bickering that intentionally delays the pace of change. Tactical GOP silence also does nothing to combat Mr. Obama's favorite talking point. Republicans, he insists, just "want to drag us back into a broken system." As unhappy as America is with ObamaCare, that line hits home. While the U.S. health system before 2010 was the best in the world, it was still too inefficient, too regulated and too costly for too many people. Consumers don't want that back, either, and Republicans suffer if their party is tagged with that position. Our health care system is and was inefficient, expensive, and bureaucratic because of too much government control, not because of too little. Despite the collectivist fantasies of the single-payer left, no top-down design can fit all of America without forcing America instead to fit to it. The basic problem with the American health care system is third-party payer. That is, if you have comprehensive health insurance or are covered by a government program, someone else decides how much your care should cost. They cannot figure out how to balance the value of your individual health care options against all of the other things on which you could spend your money. The inevitable result is that costs increase. Bureaucratic price controls, whether imposed by government or enforced by contract, are no substitute for a customer looking at a price and saying, "No." Health care costs have been rising for decades, and Barack Obama used this seemingly unstoppable trend to argue for the passage of Obamacare. He would lower health care costs -- by $2500 per family -- much as he would begin to slow the rise of the oceans. But a funny thing happened. Health care costs stopped rising quite as quickly as they had been. The White House has been claiming that lower health care cost increases are due to Obamacare, but Charles Blahous, Social Security and Medicare Trustee, shows that is not the case. The trend began while Barack Obama was still an Illinois State Senator. The most promising alternative to Obamacare, and the most likely cause of the dropoff, is already in place: the pairing of Health Savings Accounts with catastrophic or High Deductible Health Plan (HDHP) insurance. As Peter Ferrara of the National Center for Policy Analysis wrote in July, the number of HSAs rose 22 percent in 2012, and that continues a trend that started soon after they were created in 2003. 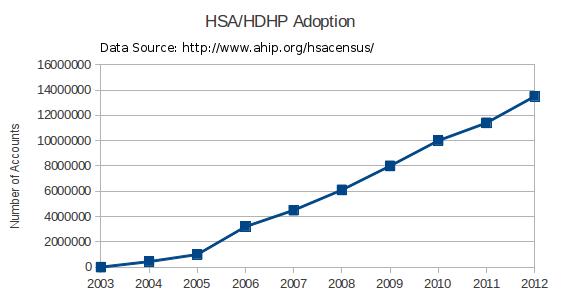 At that pace, the vast majority of Americans could have an HSA within a few years. The period in which HSAs have been growing in popularity coincides with the time the health care cost curve began trending downward. It may even fully account for lower increases in health care spending. Health Savings Accounts (HSAs) were starting to work by providing more affordable options to a wider range of people. The HSA system could actually replace Social Security, Medicaid, and Medicare, as well as supplanting Obamacare, eventually turning the HSAs into individual health-retirement accounts. The amount of money people currently pay into those programs, even if poorly managed, would provide access to medical care and a secure retirement for those who choose it. If well-managed, an HSA or Personal Retirement Account can provide the pathway out of poverty and into wealth for people who don't get sick, while allowing those who do get sick to care for themselves better than the government would care to do. The number of people whose preexisting conditions denies them access to health insurance is actually quite small. If people get sick before amassing enough in their HSA to cover their deductibles and other health expenses, their friends and neighbors should be allowed to draw from their own HSAs to help. And before you say, "But that would not be enough!" ask yourself if you had $10,000 in an HSA and your friend was struck by cancer or a drunk driver, would you chip in to help? Would you say that you are willing to help, but others would not? While there may be a place for states to provide backup to insurers (and charity) in the form of high-risk pools or other mechanisms, it should be done at the state level. Any state involvement limits the desire of people to take care of each other, but obviously there are cases in which the state has a role. Policy experts on the right are divided over how to provide the best tax treatment for HSAs and health insurance. Should it be with tax deductions or tax credits, the same for everyone or tied to income, health, or age? All of those thorny issue can be worked out over time. What is clear, however, is that despite the attempt by Obamacare designers to get rid of them, HSAs are an option that should be expanded, not priced out of the market. They provide benefits for patients, doctors, and the economic health of the nation, and the more people are educated about them, the more popular they'll become. Congress and the President should repeal Obamacare, and if the President refuses, Congress should override his veto. In its place, Congress should make simpler, gradual changes to allow free people to care for themselves and others without turning America into a bureaucratic health care system. (2) We need to forbid special deals for insurance companies for price. They should pay what they pay and how they pay but no PPO's etc. It should be illegal for an institution or medical provider to give a Cash Paying customer a different price than the Insurance company gets and NO Discount tricks here. We typically charge a Cash Payor 11 times that of an insured patient at a hospital. This is racketeering. (3) We need to require all health care providers to advertise their rates on the internet. This opens up pricing of services. In Oklahoma City a few months ago this happened when a Med-Surg Center publically posted prices and it cut prices nearly 5:1 and at the same time it flooded the area with business. (4) We need to make all non-invasive medical test devices regulation move over to NIST from FDA. For radiational based testing the FDA should set exposure standards but the devices (essentially cameras) should go to NIST so that the issue is accuracy and then we would turn on the inventors. (5) We need to make all non-invasive medical test devices Over the Counter. Yes you could go to Walmart for and MRI or X-Ray. Then the price would fall to tolerable levels and the devices would be available anywhere! (6) We need to change the Local Cost Index payment scheme to a flat for service payment scheme so that rural care resumes and competition becomes wide spread. (7) We need to make medical practicioners able to practice within the scope of their trade without permission or prescription by MD. This would open RN clinics and much more saving much cost and making health care wide spread. (8) We need to make FSA accounts able to roll over year to year. (9) We need to make all "prescriptions" have the generic option by law. (10) We need to make drug reformulation not carry any patents. This is a trick to keep drugs under patent and costs up without raising any novel or unique value. (11) We need to make medical test results the sole and only property of the person tested and if a physican causes a test the person should get the results immediately without obfiscation. (12) We need to allow medical practicioners able to provide for 10% or less of posted rates charity services whereby they would incur no liability under law and lawyers who sue such liability would be automatically disbarred. - This would open care for the poor greatly and make cherity return to America.